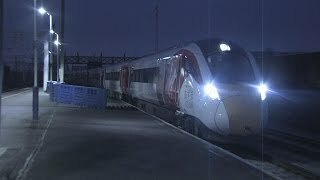 Virgin Trains launched it's own IEP train, branded Azuma, these exclusive shots show the ECS working before it reached Kings Cross. Azuma 1 pauses at Southall with the 5X79 GBRf operated move from North Pole IEP to Kings Cross for the launch of the new train in Virgin Colours. Azuma 1 pauses at Willesden Junciton with the 5X79 GBRf operated move from North Pole IEP to Kings Cross for the launch of the new train in Virgin Colours. 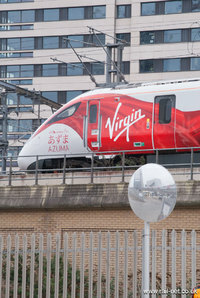 Azuma 1 pauses on the Kings Cross Incline, for 90minutes, with the 5X79 GBRf operated move from North Pole IEP to Kings Cross for the launch of the new train in Virgin Colours. Azuma 1 pauses on the Kings Cross Incline, with a new Eurostar 320 passing in the background.